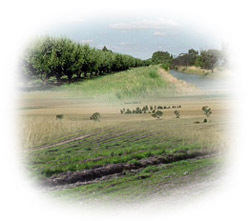 Originally the Goulburn Broken Region was covered with grasslands, woodland and forests. Today only isolated remnants remain. The first settlers of the region arrived in the 1830’s, grazing their stock in the rich grasslands along the Murray and Goulburn Rivers in the north of the region. In the 1870's, the Goulburn Valley was opened up to pastoralists which led to dairying becoming established in the 1880’s when the first irrigation systems were introduced. 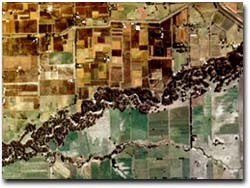 Irrigation infrastructure grew with the construction of the Goulburn Weir at Nagambie, the Waranga Basin near Rushworth and later Lake Eildon and its weir (these were all enlarged at later dates). As the population base of the region increased so did the diversity of landuses. Broad scale land clearing took place to cope with the expanding traditional practices and the introduction of cropping. The Regional Landuse Map is intended to provide a broad overview of agricultural and other land uses throughout the region. Data used to generate this map was derived from the land use layer (LANDUSE250) of the Department of Primary Industries and Department of Sustainability & Environment's Corporate Geospatial Data Library. This layer contains polygon features delineating broad agricultural land uses. 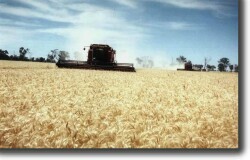 In the 1993/94 financial year, output from the SIR was $4 500 million of which $816 million was derived from agriculture (Econosearch et al 1996). Irrigated salinity, which first occurred in the horticultural areas of Tongala and Bamawm in the 1930’s. Erosion caused as a result of land clearing, salinity and rabbit plagues in the 1950’s. Dryland Salinity which was first recognised in the 1970’s.